‘THE BOARDING-HOUSE’, Sharpe’s London magazine of entertainment and instruction for general reading 29 (Jan 1859): 185-187, 187. 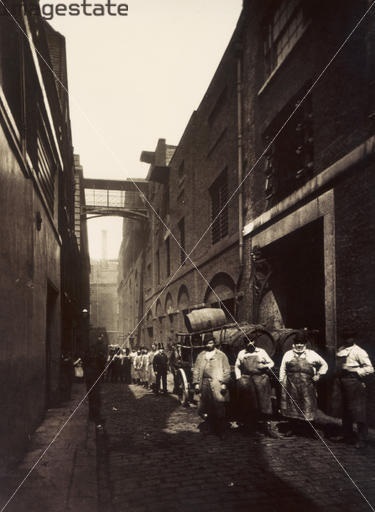 Recently, I’ve been working on a new chapter for the monograph I’m writing on nineteenth-century Bloomsbury, on boarding and lodging houses, forms of temporary accommodation that were very common throughout the nineteenth and for much of the twentieth centuries. (I realise there are important differences between boarding and lodging, but I am interested primarily in the commonalities of these forms of multiply occupied housing arrangement.) As Sharon Marcus (1999) has shown, these spaces violated the Victorian domestic ideal, bringing within the boundaries of what at least claimed to be ‘the home’ the unpredictability and danger we usually associate with the city’s streets. In addition to allowing for sexual adventure and misdemeanour, the boarding house was a space that generated daily inter-class encounter, even if its vertical form encoded a hyper-legible social hierarchy that gradated rich and poor, the ascending floors denoting class inversely so that the poorest lived up several flights of stairs in the attic. The boarding house thus compressed and verticalized urban difference. It lent itself to the proto-sociological eye, to the close anatomical observation of class in everyday life, and was valuable to the development of realism, naturalism, and modernism. 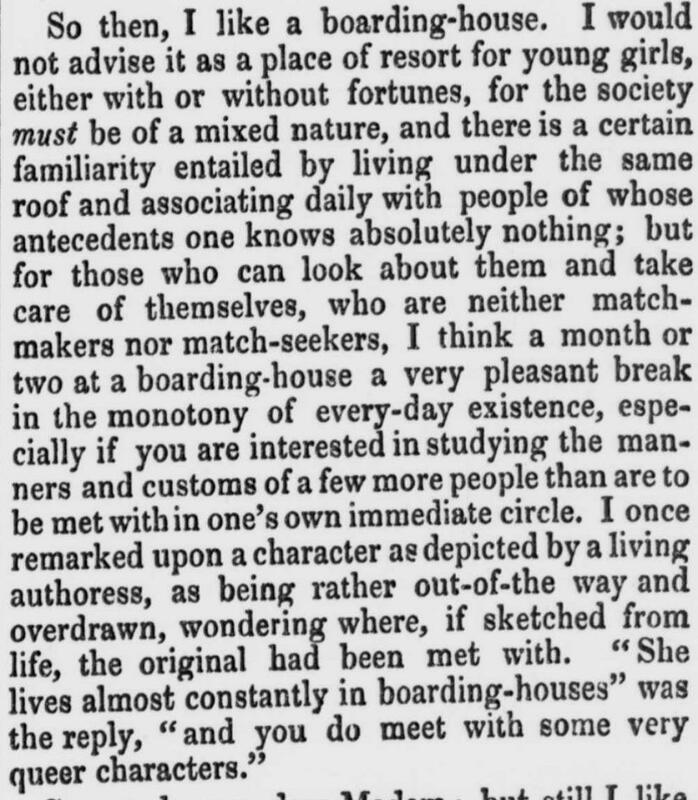 I’m especially interested in the particular kind of boarding houses Bloomsbury hosted in the nineteenth century, and in how they were represented in fiction. The ‘problem’ with Bloomsbury for middle-class commentators at this point in history was its proximity to the City, and by extension, to commerce. Its proliferation of multi-occupancy housing, in the form of its boarding houses and lodgings, as the century progressed, concretized the general problem by literally blending business with the domestic. Metonymized in the brass-plate outside the front door that advertised for guests, it was impossible for these places to maintain their distance from the idea of work and the material world, more broadly. The following, from H. G. Wells’s Experiment in Autobiography (1934), remembers the author’s experience of Bloomsbury temporary accommodation in the 1880s. Reading now the author’s railings against the iniquities of poor housing then, one cannot help but wonder what he would have made of the current housing problem in London, in which the transformation of the city into a sink for global capital means that there does appear to be, for the moment, ‘an infinite supply of prosperous middle-class people to take the houses provided’ (though not to live in them, of course). We in London still live under the negligent dominion of ‘planlessness’, but for many, the problem is precisely that, through vast inequality, some parts of the housing stock are becoming less densely occupied, not more. (The opposite is also happening simultaneously in other parts of the city, of course). One aspect of the complex mass of processes known as ‘gentrification’ is the reversion of subdivided houses of flats back into their original units, which become valuable assets to members of the extremely rich global elite. I wonder if Wells could have envisaged such a shift in London’s fortunes from laissez-faire ‘decline’ to laissez-faire ‘ascendancy’. In any case, I imagine he would have foreseen, correctly, that the ‘thousands and thousands of industrial and technical workers and clerks, students, foreigners upon business missions, musicians, teachers, the professional and artistic rank and file, agents, minor officials, shop employees’ of the present day would be equally badly served as those from his own times. ..181 Euston Road stands out very bleak and distinct in my memories. In the eighties Euston Road was one of those long corridors of tall gaunt houses which made up a large part of London. It was on the northern boundary of Bloomsbury. Its houses were narrow and without the plaster porticos of their hinterland and of Bayswater, Notting Hill, Pimlico, Kilburn and suchlike regions. They had however, narrow strips of blackened garden between them and the street, gardens in which at the utmost grew a dying lilac or a wilted privet. One went up half a dozen steps to the front door and the eyebrows of the basement windows were on a level with the bottom step. So far as I can puzzle out the real history of a hundred years ago, there was a very considerable economic expansion after the Napoleonic war, years before the onset of the railways. The steam railway was a great stimulus to still further expansion, its political consequences were tremendous, but it was itself a product of a general release of energy and enterprise already in progress. Under a régime of unrestricted private enterprise, this burst of vigour produced the most remarkable and lamentable results. A system of ninety-nine year building leases was devised, which made vast fortunes for the ground landlords and rendered any subsequent reconstruction of the houses put up almost impossible until the ground lease fell in. Under these conditions private enterprise spewed a vast quantity of extremely unsuitable building all over the London area, and for four or five generations made an uncomfortable incurable stress of the daily lives of hundreds of thousands of people. It is only now, after a century, that the weathered and decaying lava of this mercenary eruption is being slowly replaced—by new feats of private enterprise almost as greedy and unforeseeing. Once they were erected there was no getting rid of these ugly dingy pretentious substitutes for civilized housing. They occupied the ground. There was no choice; people just had to do with them and pay the high rents demanded. From the individualistic point of view it was an admirable state of affairs. To most Londoners of my generation these rows of jerry-built unalterable homes seemed to be as much in the nature of things as rain in September and it is only with the wisdom of retrospect, that I realize the complete irrational scrambling planlessness of which all of us who had to live in London were the victims. The recklessly unimaginative entrepreneurs who built these great areas of nineteenth century London and no doubt made off to more agreeable surroundings with the income and profits accruing, seem to have thought, if they thought at all, that there was an infinite supply of prosperous middle-class people to take the houses provided. Each had an ill-lit basement with kitchen, coal cellars and so forth, below the ground level. Above this was the dining-room floor capable of division by folding doors into a small dining-room and a bureau; above this again was a drawing-room and above this a floor or so of bedrooms in diminishing scale. No bathroom was provided and at first the plumbing was of a very primitive kind. Servants were expected to be cheap and servile and grateful, and most things, coals, slops, and so forth had to be carried by hand up and down the one staircase. This was the London house, that bed of Procrustes to which the main masses of the accumulating population of the most swiftly growing city in the world, including thousands and thousands of industrial and technical workers and clerks, students, foreigners upon business missions, musicians, teachers, the professional and artistic rank and file, agents, minor officials, shop employees living out and everyone indeed who ranked between the prosperous householder and the slum denizen, had to fit their lives. The multiplying multitude poured into these moulds with no chance of protest or escape. From the first these houses were cut-up by sub-letting and underwent all sorts of cheap and clumsy adaptations to the real needs of the time. It is only because the thing was spread over a hundred years and not concentrated into a few weeks that history fails to realize what sustained disaster, how much massacre, degeneration and disablement of lives, was due to the housing of London in the nineteenth century. About six o’clock, one of the vats in the extensive premises of Messrs. HENRY MEUX and Co. in Banbury-Street, St. Giles’s burst, and in a moment’s time New-street, George-street, and several others in the vicinity, were deluged with the contents amounting to 3,500 barrels of strong beer. The fluid, in its course, swept every thing before it. Two houses in New-street, adjoining the brew-house were totally demolished. The inhabitants, who were of the poorer class, were all at home. In one of them they were waking a child that died on Sunday morning. Though there is the temptation in hindsight to riff on the farcicality of what has been called The Great Beer Flood of London, commentators at the time recognised that this was nothing less than a catastrophe. In the end, the body count was eight. The dead were of Irish descent, as we might have anticipated from the flood’s location in a part of London characterised by its Hibernian immigrant population, and all of them were women and children – the men were still at work, and thus were not yet in the crowded basements they knew as home. Those who were unfortunate enough to be indoors when the vats burst clambered onto what furniture they had in an attempt to escape the rising brown waters. As so often in disasters (natural, man-made, or a mixture of the two – as in this case) poverty exacerbated the consequences of the initial calamity. That marginal detail of antediluvian infant mortality reminds us that the accident only supplemented a generally high child death toll, it being for the poor in particular an all too common part of the fabric of everyday life. The Morning Post Wed 19 Oct 1814. The Morning Post Sat 29 Oct 1814. Frances Hodgson Burnett, novelist of several famous children’s fictions, including The Secret Garden (1911), also wrote a novella called Editha’s Burglar that was published in 1877. 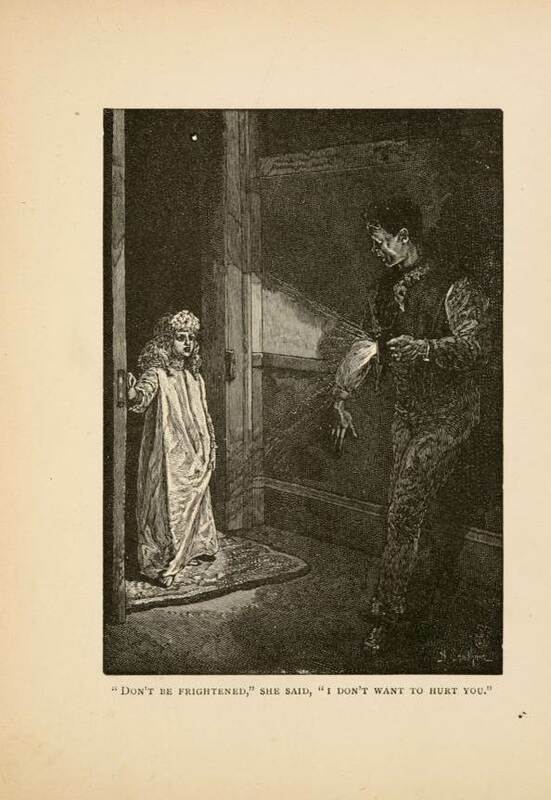 The illustration above accompanies the somewhat sickly episode when, on hearing some noise on the ground floor, the saint-like child of the title creeps downstairs and disturbs a burglar at work. As the caption records, she kindly warns him not to be frightened – ‘I don’t want to hurt you’ – before requesting that he be quiet so as not to wake her sleeping mother. When, in 1904, Edith Nesbit rewrote this incident in The Phoenix and the Carpet (1904), she played it much more for laughs. Her children have obviously read earlier depictions of encounters between children and burglars, such as that related above, and struggle to remember the etiquette. The language is strikingly physical, ‘encroached’, ‘beaten’, ‘trampling’, ‘filled up’, and ‘thrown’ being suggestive of some kind of violence, a primal scene of abuse that can only ever be partly hidden by the ‘oblong centre bed’ that currently features. The advertising boards that surround building plots describing fully-built houses aim to distract attention away from the sites as they actually appear, suggesting that they are peculiarly future-oriented kinds of space. [ii] Yet construction work has an unintentionally lengthy afterlife in the places where it is has been undertaken, echoes of the builders’ ‘trampling feet’ lingering on in ideally feminised domestic environments long after the workmen have vanished. In the new suburban houses, constructed swiftly by speculative builders at the edge of Victorian cities, and in particular, London, it was a challenge for the owners to make the best of it: in their gardens, women of the ascendant swollen middle classes were on the front-line, working hard to secure what social capital they could from the commodity into which they had invested: to transform a plot into a garden, and thus, a house into a home. [i] Caroline A. White, ‘Home Gardening for Ladies’, The Ladies’ Cabinet, 1 Jan 1857. [ii] Ian Sinclair writes compellingly of the weirdly futuristic character of contemporary building plots and the advertising billboards that encircle them when he discusses the site in Hackney currly being prepared for ‘London 2012’ : ‘this termite activity, the neurotic compulsion to enclose and alienate, justifies itself by exploiting temporary fences to use as masking screens, noticeboards for sponsors’ boasts, assertions of a bright, computer-generated future.’ ‘The Olympics Scam’, in London Review of Books, Vol. 30 No. 12, 19 June 2008, p17-23. G. K. Chesterton was among the most astute and fair-minded of commentators writing in the early twentieth century upon the Victorian period. His work on Dickens is particularly rich and stimulating in its insights, connecting questions about stylistic and imaginative temperament with those about political and social identity, in ways that are often as surprising and provocative as they are entertaining. In the excerpt below, from Appreciations and Criticisms of the Works of Charles Dickens (1911), he makes a case for Dickens’s last completed novel, published serially 150 years ago, suggesting that it represents a benign ‘Indian summer’ of vulgar farcicality, the ‘democratic’ mode with which the novelist began his writing career and which Chesterton sees as his greatest achievement. Interrogating the title of the book, he sees the inelegant awkwardness of its linguistic construction as a sign of the happy persistence of the uneducated within Dickens’s persona into the final years of his career. Whereas, according to Chesterton, amidst the ‘reaction’ and ‘decay’ of the 1850s, Dickens had become partially co-opted into the fashionable high society he initially railed against, in the very title of Our Mutual Friend he rebels against the ‘aristocratic sentimentalism’, which valued propriety and etiquette over justice and the good, into which he may have been slipping. In an ingenious spectral pun, Chesterton’s Dickens appears to be using his novel’s title to lay down his continued opposition to a corrupt social system that values the scholarly titles of universities and the landed titles of aristocracy above true merit. Our Mutual Friend marks a happy return to the earlier manner of Dickens at the end of Dickens’s life. One might call it a sort of Indian summer of his farce. Those who most truly love Dickens love the earlier Dickens; and any return to his farce must be welcomed, like a young man come back from the dead. In this book indeed he does not merely return to his farce; he returns in a manner to his vulgarity. It is the old democratic and even uneducated Dickens who is writing here. The very title is illiterate. Any priggish pupil teacher could tell Dickens that there is no such phrase in English as “our mutual friend.” Any one could tell Dickens that “our mutual friend” means “our reciprocal friend,” and that “our reciprocal friend” means nothing. If he had only had all the solemn advantages of academic learning (the absence of which in him was lamented by the Quarterly Review), he would have known better. He would have known that the correct phrase for a man known to two people is “our common friend.” But if one calls one’s friend a common friend, even that phrase is open to misunderstanding. I dwell with a gloomy pleasure on this mistake in the very title of the book because I, for one, am not pleased to see Dickens gradually absorbed by modern culture and good manners. Dickens, by class and genius, belonged to the kind of people who do talk about a “mutual friend”; and for that class there is a very great deal to be said. These two things can at least be said—that this class does understand the meaning of the word “friend” and the meaning of the word “mutual.” I know that for some long time before he had been slowly and subtly sucked into the whirlpool of the fashionable views of later England. I know that in Bleak House he treats the aristocracy far more tenderly than he treats them in David Copperfield. I know that in A Tale of Two Cities, having come under the influence of Carlyle, he treats revolution as strange and weird, whereas under the influence of Cobbett he would have treated it as obvious and reasonable. I know that in The Mystery of Edwin Drood he not only praised the Minor Canon of Cloisterham at the expense of the dissenting demagogue, Honeythunder; I know that he even took the last and most disastrous step in the modern English reaction. While blaming the old Cloisterham monks (who were democratic), he praised the old-world peace that they had left behind them—an old-world peace which is simply one of the last amusements of aristocracy. The modern rich feel quite at home with the dead monks. They would have felt anything but comfortable with the live ones. I know, in short, how the simple democracy of Dickens was gradually dimmed by the decay and reaction of the middle of the nineteenth century. I know that he fell into some of the bad habits of aristocratic sentimentalism. I know that he used the word “gentleman” as meaning good man. But all this only adds to the unholy joy with which I realise that the very title of one of his best books was a vulgarism. It is pleasant to contemplate this last unconscious knock in the eye for the gentility with which Dickens was half impressed. Dickens is the old self-made man; you may take him or leave him. He has its disadvantages and its merits. No university man would have written the title; no university man could have written the book. Incidentally, though I think Chesterton is onto something, his analysis doesn’t quite fix down what is going on with this complex title. He seems to forget, for one, that the construction ‘Our Mutual Friend’ is one that belongs to one of the characters of the book, the illiterate Mr Boffin, when he employs it to tiptoe around speaking to Mrs Wilfer about her mysterious new lodger Mr Rokesmith. As is so often the case in Dickens, the democratic quality of his writing rests on its capacious polyvocality, its inclusion of all sorts of voices and idiolects, which are quite different from those we would associate with the writer’s own subject position. Chesterton may well be right that other university-educated novelists would have thought twice about placing such a ‘non-U’ phrase at the helm of their narratives, but this may well be because Dickens’s versatility in ventriloquism meant that he was confident enough to try out a whole repertoire of different voices without fearing any in particular might stick! London is a city that, though its fabric is constantly changing, preserves and redeploys much from its past. One of its surviving nineteenth-century features about which I’m slightly obsessed is those iron railings that mark out its squares and parks. Catalina Pollak is an Argentinian artist, living in London, who has channelled her fascination for these items of street furniture into an amazing public installation which commemorates the moment when, in the second world war, railings were removed from the metropolitan scene. In their absence, the ‘phantom railings’ make the sound of someone clanking a stick against them as passers-by walk along the pavement. In a powerful yet subtle political gesture, Pollak’s work makes us think about the ways in which access to urban space is overly restricted and hierarchized, one of the less laudable inheritances the Victorians bestowed upon us.